Coral Expeditions is an Australia-based cruise line formerly known as Coral Princess Cruises, which was founded in 1984. In 1988 and again in 1996, Coral Princess I and II (renamed Coral Expeditions I and II in 2015) were commissioned to replace the original launch. Powered by modern, safe and efficient marine diesels in steel and aluminium hulls, the line could now accommodate more than 100 passengers on extended voyages as far as Townsville and Cooktown. Scuba diving, shore excursions and marine biology education form part of the repertoire, offering more than a simple cocktail cruise and sightseeing. The line meets the rigorous requirements of Ecotourism Australia to be recognised an accredited ecotourism operator. Eco-certified tourism businesses endorse "environmentally sustainable, economically viable, and socially and culturally responsible operations" -- a logical endorsement for any small ship cruise company operating in such sensitive environments as the Great Barrier Reef. In 2005, the company launched 72-passenger purpose-built expedition yacht Oceanic Discoverer, renamed Coral Discoverer in 2015. The state-of-the-art vessel was built in Cairns by NQEA, which also supplies military and commercial vessels to local and international markets. All of ships are Australia-based, Australia-flagged and employ all-Australian crew, making them one of the few truly Australian cruise companies. The company's field of operation now includes Papua New Guinea, New Zealand, the Kimberley, Northern Australia, the South Pacific, the Spice Islands and Sulawesi. Coral Expeditions delivers a casual style of small-ship and adventure cruising, with an informal atmosphere and all-Australian crew. The majority of passengers of this Australian-flagged line are locals, but there is always a contingent of other nationalities, the size of which varies depending on whether a group booking is aboard. The three ships in the fleet have a similar ambience, although the flagship and newest member, Coral Discoverer, has a noticeably higher level of appointment and equipment -- not only because it is the newest, but because it was built to SOLAS (international) standards. Despite the small size of the ships, there is not a feeling of being cramped or constrained. Think of them more like large private yachts than miniature cruise ships. The bars and public spaces are more like what you'd find at a small boutique hotel than a cavernous cruise ship, and that's the attraction for many people. They enjoy 'small footprint' travel into remote locations inaccessible or unsuitable for large, conventionally sized cruise ships. Australians make up the vast majority of passengers. English is the only official language spoken onboard. Dress code is resort casual and sun-smart, although collared shirts for men and nice blouses for ladies will be appreciated at dinner. 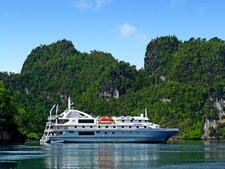 The three-ship fleet comprises Coral Expeditions I, Coral Expeditions II and Coral Discoverer. These Australian-flagged vessels are purpose-built to access remote coastal areas on extended voyages. 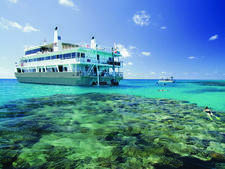 The 46-passenger Coral Expeditions I explores Cape York, Arnhem Land and the Kimberley. 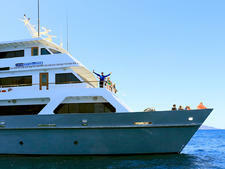 The 44-passenger Coral Expeditions II operates year-round in the Great Barrier Reef. The larger 72-passenger Coral Discoverer offers expeditions in the Kimberley, South Pacific, Papua New Guinea and Tasmania. 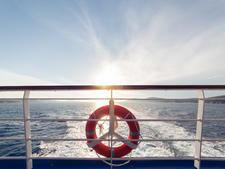 All ships are staffed with Australian crew and feature local produce and wine. In April 2019 Coral Expeditions will welcome the new, purpose-built Coral Adventurer. As Coral Expeditions’ largest ship, it will accommodate 120 passengers in 60 staterooms. Coral Adventurer will operate expeditions through the islands of Indonesia, the Kimberley, Papua New Guinea and the Spice Islands in 2019 and 2020.